Identifying future classic Rolex from the 1990-2018 era - Part 4: Rolex 16710 GMT-Master II "The Stick dial"
This is Part 4 of the series of “Identifying future classic Rolex from the 1990-2018 era”. I am attaching Parts 1, 2 and 3 below in case anyone missed them. Part 4 - The Rolex GMT-Master II "The Stick dial"
The Rolex GMT Master II Reference 16710 was produced from 1989-2007. It was the last GMT before the ceramic inserts took over. It was typically supplied with the 3185 caliber but late models saw an upgrade to the 3186 caliber. As detailed in Part 3 of this series, the 16710 dial saw a number of evolutions as tritium was replaced with luminova and then super luminova. However, the 16710 also saw another dial variation that marks it as collectible. 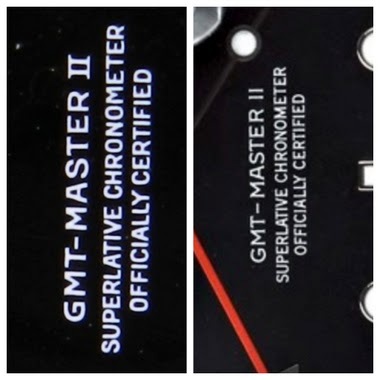 Namely, towards the end of its production cycle, the typeface on GMT Master II was changed and gave rise to what has become known as the “Stick Dial”. In the latter years of production of the 16710, Rolex introduced a subtle dial variation. GMT Master II originally saw the “II” written in Roman numerals. In latter years of production, the change saw it move to GMT Master II written as a form of straight stick rather than Roman numeral (see image below). Some students of Rolex have argued that the “Stick dial” represents the transition from the 3185 caliber to the 3186 caliber. To be blunt, sometimes Rolex just did things without anyone really knowing why. It is part of the frustration as well as part of the fun of collecting Rolex. I think it is fairly hard to be definitive on why Rolex made a dial alteration on the 16710, but they did. Rolex, being Rolex, put this new variant dial on the latter year runs of caliber 3185 as well as the new 3186. In either caliber, the dial variation is rare. Empirically, I have seen about the same number in a 3185 as a 3186. I think it is fair to say that all both are rare. 1) It is a transition model away from the traditional inserts to the modern ceramic insert. The last traditional Pepsi insert in fact. 2) The 3185 caliber is a Rolex warhorse of a movement. Now out of use, but one of the most reliable and sturdy movements that Rolex have ever made. 3) There is a dial variation that is easy to identify that differentiates the “Stick dial” from other 16710 dials. In terms of scarcity, one does not see many “Stick dials” simple because not that many were made. On Chrono24, I can see around 400 GMT 16710s for sale. Perhaps 5-7% of this total contain “Stick dials”. That makes it rare enough to differentiate it against ordinary 16710s, but also not so impossible as to make the hunt unrealistic. Rolex GMTs are, and always have been, very popular references. 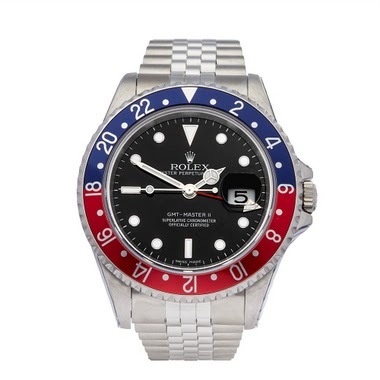 To find a nice “neo-vintage” Pepsi or Coke GMT that is totally reliable, in great condition that also has a dial variation that makes it rare is something that ticks a lot of boxes. I think it is fair to say that the 16710 GMT-Master II “Stick dial” is already starting to become a collectors target. I think this will continue to be the case and this watch definitely deserves a place in my Top 10 future classics list. Coke probably less produced then Pepsi? Another question: what is the correct box to go with one of these? I see some (same year) with the old boxes and some with the new boxes? Tricky..... .......Coke is probably rarer though Pepsi is more popular. As for the boxes, I will need to check as the production run is so long that the box style will almost certainly have changed. Very well researched, as usual However, I am not sure how this qualifies as a "future" classic, given that these "stick dial" versions of 16710 and their 3186 movement already command significant premiums over regular 16710's. Boris.... .... everything is relative. Yes, there is a premium building on these but it’s not at a point where it can be described as a “classic”. Think of it as a spectrum. It’s moving along that spectrum. Great post, again. One of these days, I will be forced to act on your 'advice'. First, you make me do math. Next, you're 'advising' me... This will get expensive. the thing is...... In PP, you won't go down the WT path. So that really leaves a gap on travel type watches..... Of which....GMT is one.